What are the best ways to defeat rising damp, combat yellowing cotton and fix noisy water pipes? Full of invaluable and easy-to-follow advice for indoors and out, The Home Book has all the answers for you. 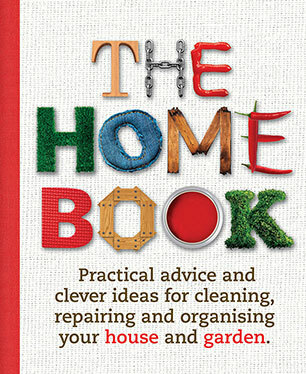 The Home Book provides simple techniques for cleaning, maintaining and repairing your home. Save money using The Home Book's own recipes for household disinfectants and follow the invaluable stain removal tips - did you know you can get rid of lipstick stains with kerosene and use milk when removing ink on cotton? Other handy hints are great for the environment as well as your budget, such as running your fridge between 3°C and 5°C to reduce electricity costs. Tips on growing herbs, making your own straw compost and tending a worm garden will guarantee you get the best out of your outdoor space, whether it's a garden or apartment balcony. Every home will benefit from this book that is packed with clever ideas, practical information and helpful hints. The Home Book is an indispensable DIY manual.